On January 3rd 2009 – it was the fifth anniversary of when I got introduced into online marketing. On January 14th – it was the third anniversary of my business in Singapore – Rachit Dayal Communications. Theese dates mean a lot to me – and to reflect and thank the people who’ve made it possible – I thought it’s time to write a little note. Now, to be completely honest, I wasn’t very good at it in the beginning. There were so many times in the early projects that I can’t believe my clients actually tolerated me. I wasn’t very communicative, my skill hadn’t grown to today’s level and I wasn’t focussed on providing an ROI for the person who hired me. But for some strange reason, the clients did keep working with me. Sometimes they tolerated me, most of the time they actually taught me lessons. And they had to do none of this – it was very kind of them to trust a fresh kid with their websites and online strategy. Many clients, prospects and friends have wondered how I got into this unique career – being an independent consultant while the rest of my collegaues give large companies a shot – focus on online marketing, while everyone else gravitated towards safer career choices. And so for their benefit, here’s a little “Cliff’s Note” on my journey in Online Marketing. The date was 3rd January 2004. I’d just landed in Philadelphia, USA, dumped my suitcase at in the hotel room and hurriedly rushed out back to check out my new office. You see, I’d just been hired to work as an intern in a technology startup in the USA – and I’d flown out from Singapore to join in. And I was really excited because I couldn’t believe my luck in getting hired by such fantastic people and have such a great opportunity. Interesting sidenote - because we were broke students, we stayed at a christian motel instead of a real hotel. And they had archaic rules. For example, girls weren’t allowed to wear pants – only skirts and sarongs (in the freezing sub zero temperatures). So, all my fellow travellers would disguise sarongs on top of their pants and they’d be an interesting “stripping session” just outside the hotel. Anyway, the job was better than my dreams – my new boss spent the first day taking me out for lunch and out shopping. Can you believe it – I spent my first day on the job, with the Chief Operating Officer (my boss) shopping for office electronics and chatting with me about my dreams and goals (instead of typical intern jobs like getting coffee and doing actual work!). That was how I got introduced to online marketing. I’d been making websites from the mid 90s in school, but I never understood how the web could affect business until I was trusted with the responsibility to make it happen. And from day 1, it felt right – like it was something I was meant to do my whole life.That was how my story began – for the next two years, I did odd jobs in marketing as I wrapped up my degree at the National University of Singapore. 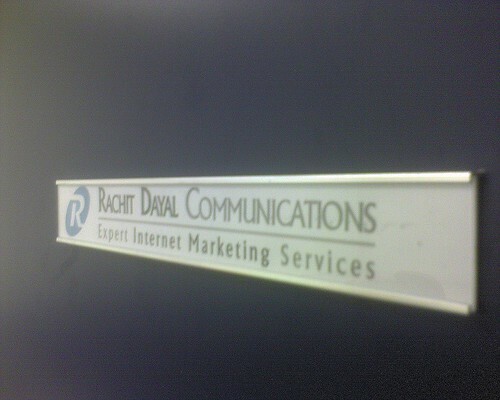 And on January 14th 2006, the official business registration of Rachit Dayal Communications. A little over two years after I started marketing online, I was set up with a business and ready to serve clients. The next three years have been a vivid dream – so full of learning, growth and excitement that I have trouble remembering anything before it. I’ve grown as a marketer, an advisor and a person. In the rest of this post, I’d like to acknowledge the people who’ve made it possible and the share some lessons for others who may travel down this path in the future. Skills wise – I started from AdWords. Grew into web design. Expanded into Google Analytics & Website Optimizer testing. And now, I’m finally moving full steam into consulting and training. Work wise – I moved out my bedroom into an office. And out of the office into working from client sites. It might be sounding repetitive by now, but it’s been an extraordinary journey. And despite the learning curves, it’s been exactly what I imagined at the beginning of the journey. And even though 2009 looks like a tough year to get more profitable, but I’m focused on innovating and finding new ways to help my clients do exactly that. Congrats on your anniversary! Following your passion and pursuing your dreams are never as easy as it was assumed to be, but you did it! So here’s to more to come, ya? and see u in philly again.